My favourite brunch place doubles as Ann Arbor’s only gay bar at night. 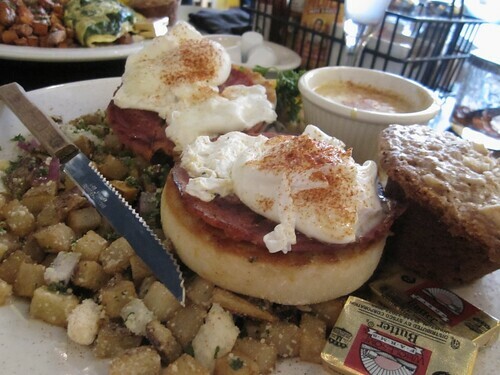 Their slightly twisted weekly takes on Eggs Benedict (this one with a yummy spicy ham) is always a winner. The potatoes are especially tasty. For mains at Pacific Rim (my favourite restaurant and former place of employment before I joined the big bad world of PR), my dilemma is always ‘Do I go for my favourite, my other favourite, or my other other favourite?’ This particular time I went with my ‘other’: the Big Eye Tuna. 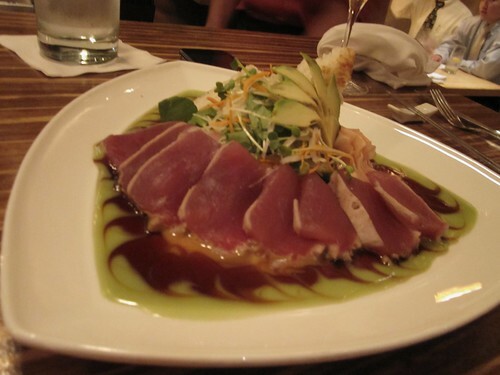 Seared tuna with a wasabi cream, ginger-miso and sweet soy sauce, served over crispy rice with a daikon salad. It is superb. 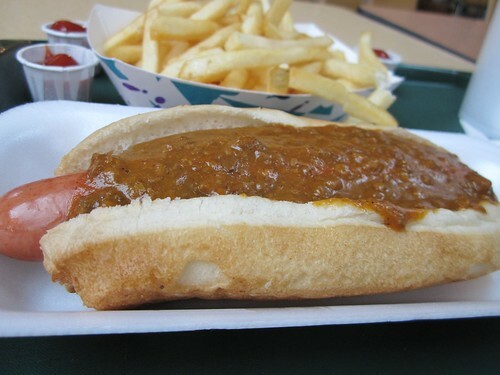 And of course, what trip to Michigan would be complete without a trip to a Coney Island? Whether Kerby’s, National or one of the many ‘off brands’, the consistency of the chili that goes on that lovely dense meaty pipe, is just something that can not be replicated in the UK. And to balance the hot dog, we must mention the glorious burger. 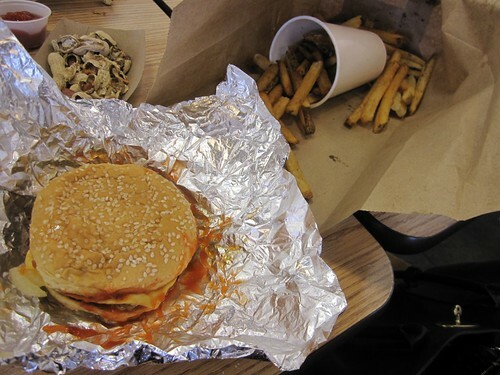 Five Guys is a national chain famous for the accolades of President Obama, their anything-you-want-on-it-for-free toppings and the all you can eat peanuts. They made it to Michigan shortly after I moved away, but I’ve tried almost every time to make it back when I’m home. It’s melt in your mouth goodness. Part 2 including fried chicken, more BIG American breakfasts and the Cuban street food place du jour coming up soon! what are your other two picks at pac rim? the sablefish? scallops? mmm. and those look like regular fries at five guys. you’ll have to get the cajun fries next time!